In 2016, bears and people live together in increasingly crowded quarters. That’s true not just in the rural landscape and private lands near national parks and forests, but also in suburban and even urban neighborhoods. 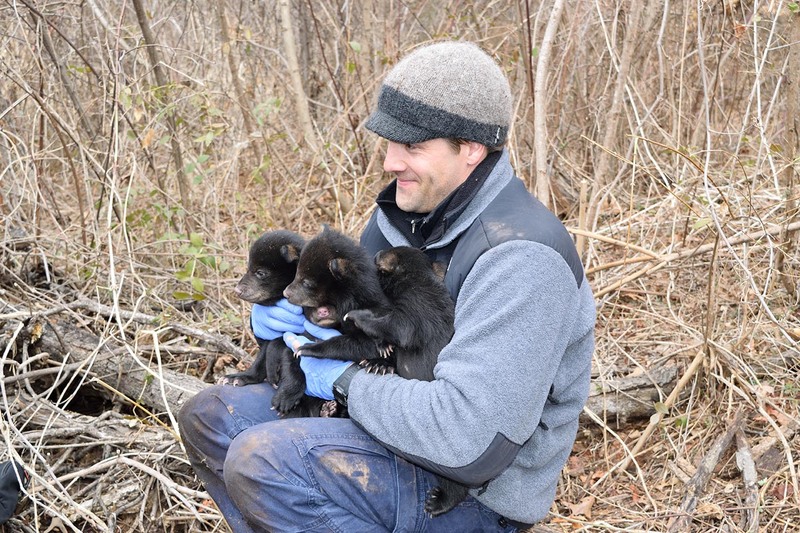 Nicholas Gould, a graduate research associate in fisheries, wildlife and conservation biology at North Carolina State University, and his team are tracking bears near Asheville using GPS collars. 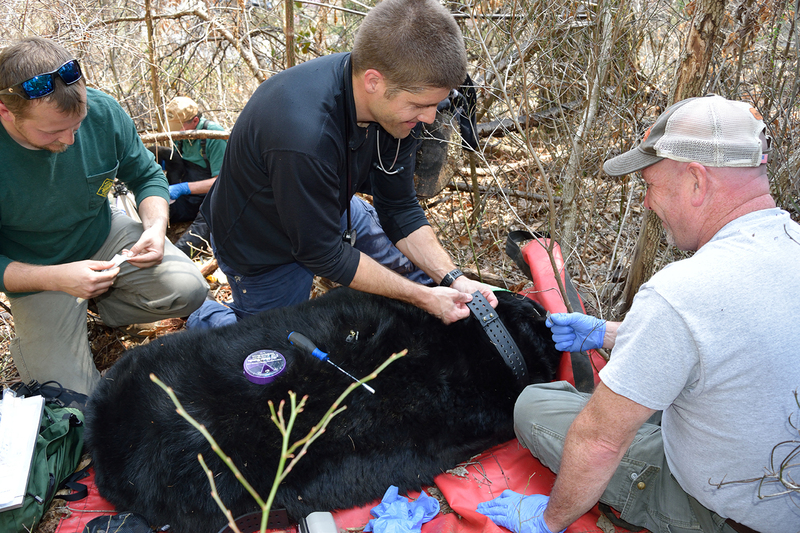 The North Carolina Urban/Suburban Bear Study is a five-year, joint project between NCSU and the North Carolina Wildlife Resources Commission that launched in 2014. Gould’s team traps and sedates bears before gathering a series of data points and, if the animal is large enough, fitting it with a GPS collar. They’ve tagged more than 120 bears so far, including some within city limits. The team has also seen a rise in the number of bears, with fatter individuals having more cubs—all of which indicates plentiful food. “We found that the Pisgah Bear Sanctuary did provide some protection for the bears compared to places outside the sanctuary, where hunting was legal,” Powell says. “In the ’80s, there was a good bit of poaching inside the sanctuary”—activity that led to the legendary Operation Smoky near the end of the decade. BRO-TV: Urban-Suburban Bear Study from Blue Ridge Outdoors on Vimeo. There’s only a small overlap between Powell’s old study site and Gould’s new one, yet they’re part of a larger scholarly body of research on black bear populations in western North Carolina. The North Carolina Wildlife Resources Commission’s Black Bear Committee proposed and developed Gould’s study. Powell says the study is “amazing” and marvels especially at the finding of just how much faster city bears are growing versus those who live out in the national forest. Gould’s findings underline that adaptivity. Bear populations and human populations are both on the rise. People increasingly encroach into bear habitat through suburbanization of old farms and forests, and bears increasingly encroach into urban enclaves. That inevitably means a rise in interactions. Last year, I woke in the moments before sunrise and watched as an absolute hulk of a bear strode up the ridge above our house. I summoned our little boy, and he got a glimpse of the dark shape moving through the woods. A week later, we rose at 5:30 a.m. and I was making coffee when I noticed something in the yard. My eyes made out that same hulking shape, moving through our yard, between the blueberry bushes and the goat field. I grabbed my phone, walked out onto the front patio, snapped a quick photo and started clapping and shouting at the bear. Moving laterally thirty yards away, it picked up its pace through the yard, ascending into the woods before our Pyrenees noticed it and started barking. Moments later it had disappeared into the brush. I didn’t see it again. But earlier this week, my wife and son told me they’d seen two bear cubs on a dirt road near the house. I thought out about that, and the interviews and conversations I’d had about bears for this story. And then I walked outside and took down the bird feeder. 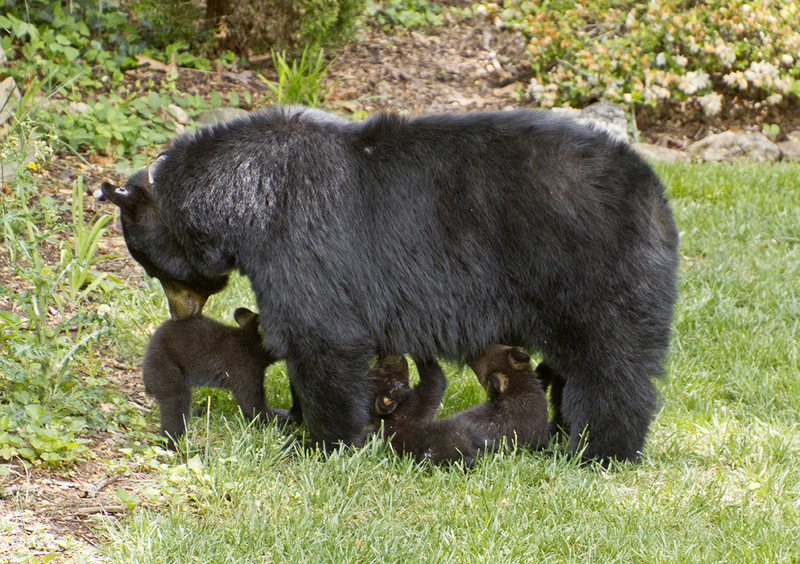 Learn more about the North Carolina Urban/Suburban Bear Study—along with tips for living with bears—at ncwildlife.org/bear. Find out more about bear studies, projects, safety, and habitat protection in Great Smoky Mountains National Park at friendsofthesmokies.org/bears.